Have you ever wondered how to ice, or flood, sugar cookies, but just didn't know where to start? Well, here we have an easy 5-step photo tutorial that will take you through how to flawlessly ice your sugar cookies, from start to finish. It just takes two icings: one thicker and one thinner, along with a few squeeze bottles. If you don't have squeeze bottles, you can use pastry bags with a small round tip opening instead. The squeeze bottles are easier to store and to manage when doing small and intricate designs, so they are preferable. But if you don't have them, not a problem! 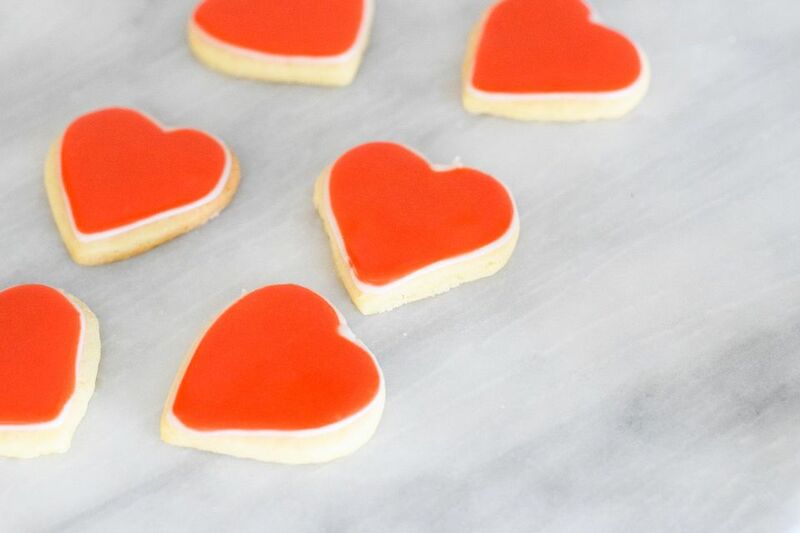 The best part about this technique is that you can use this method to ice any sugar cookie throughout the year: Easter, Valentine's Day, Christmas, or just for a sweet treat whenever you'd like. Make several different colors of icings to create beautiful and festive designs! Stick with us and you'll be a professional in no time! Create one thicker icing for edging the cookies. This will create a barrier for when you flood the cookie. Then create another, thinner icing that you will use to do the flooding of the cookies. Whisk all ingredients together in a large bowl, until smooth. Then split the icing into two bowls. Add 1 teaspoon of water to the first bowl. This will act as your icing for the edging. Add 3 teaspoons of water to the second bowl. This will act as your thinner icing for the interior. Dye each batch the color of your choice. Then place the icing into separate squeeze bottles. Use different sizes, or label them, so you know which one is the thicker and which one is the thinner icing. Next, after you have made your icing and separated it off into two different bottles, use the thicker icing to create an edge along the cookie. Make sure the edge is one complete line that connects the entire rim of the cookie, otherwise the thinner icing will spill through the edge, giving a new meaning to "flooding" cookies. Speaking of flooding cookies, grab your second batch of icing - the thinner one - and drizzle the icing all over the inside of the cookie. Since it's thinner, it will spread to fill most of the cookie. Try to squeeze the frosting as close to the thicker edge as possible without squeezing too much, so it won't spill over. For the sections that the frosting did not fill, use a toothpick to spread the frosting and evenly disperse the icing to cover the bare patches. You can also use the toothpick to pop any small bubbles that might form on the surface of the icing. If you are looking to add sprinkles or candy pearls, now is a good time to add them. This will ensure that they will stick to the icing, creating a better bond, so that the sprinkles and/or candy pearls don't fall off later. Allow the cookies to dry completely so that the icing can harden. (This may take up to 24 hours, depending on how thin the inner icing came out). Once the icing has dried, you can add additional designs with the thicker icing. Since the frosting has completely hardened, the thicker designs will sit on top of the cookie and will not bleed or spread. Wrap up in cute cellophane bags with ribbon as a gift, or serve immediately to your family and friends!